Before watching this video about Frank Luntz by Samantha Bee (The Daily Show, Jan 14, 2006), make sure you you are not sitting in a quiet zone. 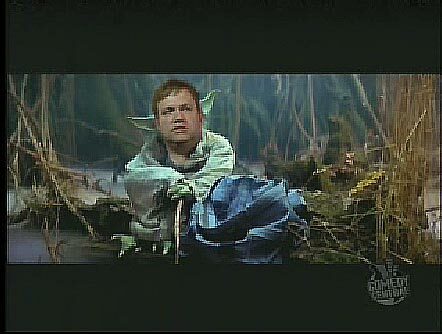 Among other chestnuts, Bee calls Luntz the Republican's "amoral Yoda," and spells out exactly why PBS should not have tagged him to give commentary in this week's Democratic Presidential Candidate Forum. My advice to PBS? Switch Samantha Bee for Luntz--she would do a much, much better job. 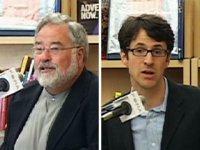 On May 8, 2007, I joined George Lakoff for an evening at Cody's Books in Berkeley, CA. Both CSPAN's BookTV and FORA.tv were in the room recording the event, and now the FORA.tv version is up and ready for viewing. It was a fun evening all around. Clicking on the photo will take you to FORA.tv for the video, but feel free to put feedback here on Frameshop. In their upcoming Democratic Presidential Candidate Forum (June 28) PBS has chosen well-known Republican propagandist Frank Luntz to offer solo follow-up analysis, calling him a 'noted pollster' without any reference to his decade of work on partisan Republican campaigns that, among other things, re-branded the Democratic Party as dangerous, angry and anti-American. To help boost his credentials for the show, PBS even booked a long interview with Luntz and Tavis Smiley just days after the initial press release. Not only does Luntz have a history of misrepresenting the facts of his research--for which he has been censured by--but he has a documented track record of posing as an impartial expert on public broadcasting in order to launch partisan attacks on Democrats. Claiming to be a researcher who just "listens" to people to bring "clarity" to public debate, Luntz is in fact a strategic political framer who launches deceptive PR campaigns for Republican clients using broadcast media to advance their agenda. If Luntz is on TV, he is working for his top client: the Republican Party. For those who remember, Luntz used to work for MSNBC who also billed him initially as an impartial analyst. When the American public complained to MSNBC about Luntz's obvious partisan Republican agenda, he was replaced. Despite being a well-known, highly-partisan and highly-paid Republican operative--famous for his role in branding liberals as "angry" and hated by Americans--Luntz continues to represent himself and his work to PBS, and to the American people, as nothing more than an ordinary researcher who 'listens' to the public. In fact, the truth behind Luntz is that all his work is in the interest of those who pay for his services: the radical wing of the Republican Party. Any commentary Luntz offers on PBS after the Democratic candidate forum will not be in the interest of PBS viewers, but in the interest of the radical wing of the Republican Party. Not only will Luntz offer deceptive commentary framed by a radical GOP agenda, but he will alienate the vast majority of PBS viewers--Americans of all political leanings who are tired of turning on their televisions to engage the civic debate, only to be slapped in the face by cynical consultants masquerading as impartial analysts. Despite the fancy focus group technology at his disposal, Luntz is a dishonest choice for PBS' post-debate analysis. The executive producers of the PBS forum would be wise to replace Luntz with another expert whose professional work and political agenda is not so blatantly at odds with the candidates he or she is charged with analyzing. During the Arizona swing of my Framing the Debate book tour, a reporter from Failure Magazine named Jason Zasky turned out for an event. I started reading FM when it first launched, so I was happy to make the connection. A week later, Jason interviewed me by phone about the book, framing and politics in general. A transcript of the interview is now available on the Failure Magazine site. Jason did a good job hitting me with questions that cut to what framing is about and bring the reader to some big issues of concern/interest at Frameshop. If you find yourself wondering what a good alternative to a big media reporter looks like--Zasky is your answer. So head over there, check it out, and give Jason's piece some traffic from your own sites. The book announcement this week is that Frameshop now has a Facebook group. If you are already a member of Facebook, please join the Frameshop group. If you are not yet a member, joining Facebook is free and easy. Once you join, invite me to be your friend and join the Frameshop group. Why this new development? The suite of community networking features offered by Facebook are a great compliment to the analytical focus of the Frameshop blog. By setting up a Frameshop group, readers and contributors to Frameshop can get to know each other, plan events and stay in better contact. In particular, the Frameshop newsletter emails will switch over to Facebook announcements--which will be a very large improvement. All of this means that the conversation will grow and extend across two platforms--allowing for us all to connect better and work more efficiently for progressive change. One way to try to change course is to stop funding for the war, which sends the wrong message to the troops and won't pass in Congress. The better way to change course, an option that is also more likely to succeed, is to place in law a requirement that the president do so. The "wrong message"? Senator Levin, the only way to send a wrong message to our soldiers is to tell them that Democrats will try anything short of everything to bring them home. "We will try everything--without pause, without fear--to end the Bush Iraq policy that is destroying the lives of America's soldiers!" That is the only right message to send the troops. Can you not see that, yet? But beyond that basic point,do you honestly believe that our soldiers in Iraq are somehow getting the right message already? Have you not noticed, sir, that the Bush administration has been waging a PR war--a framing war--aimed at the American people and at our soldiers in the field with far more effectiveness than any of their policies on the ground in Iraq? The Bush administration, for its part, has spent the past 7 years sending the "wrong message" to our soldiers. Bush sent the wrong message that America needed to invade Iraq because Sadaam Hussein attacked America on September 11, 2001. Bush sent the wrong message that the invasion of Iraq could be carried out with far fewer soldiers than needed. Bush sent the wrong message that the U.S. occupation in Iraq was preventing the rise of terrorism. Bush sent the wrong message that American soldiers would not be exploited for political purposes. Senator, the wrong message cannot be sent by those who oppose Bush's Iraq policy. The wrong message can only be sent by those who support it. In particular, Senator, over the past 7 years President Bush has been sending a message so wrong that it has led to the criminal destruction of our valued military: the message that the Democratic Party is a danger to the safety and security of the American people. The cruel irony of that wrong message from President Bush is obvious to every American--including those Americans fighting in Iraq: the more President Bush says that Democrats are a danger to our troops, the more President Bush's Iraq policy destroys the lives, families and reputation of the U.S. military. And yet--in the midst of almost two full Presidential terms of wrong messages--and the hundreds of thousands of ruined and lost military lives that have resulted--Americans are somehow supposed to believe that a piece of legislation from Democrats in the Senate will somehow start the process of harming our soldiers' morale? Wake up, Senator! Wake up! Nothing the Democrats in Congress can do in their efforts to stop the Iraq policy can harm our soldiers more than the Bush administration harms them every single day. Nothing! The Bush administration does more harm to our troops on an hourly basis than any message or any act by any other elected official in the history of our country. As for messages and actions with the potential help our soldiers, there is no place to go, but up. Every bill, every attempt, every message from the Democrats that seeks to stop the Bush policy from swindling the patriotism and squandering the lives of our soldiers can only send the right message, the good message--the just message--our troops. Senator, America's soldiers are not looking to see how well the Democratic Party bends to the bullying of the Bush administration. Rather, our soldiers look to see when the Democratic Party will finally stand up and embrace the power given to them by the American people--the power to slap down the grotesquely wrong messages sent by the Bush Administration, the power to act in the interest of our soldiers and not out of fear of political retribution. In other words, Senator, the only wrong message you can send to our soldiers is the message that says: there are somethings we will not do to get you home. So get back to work, Senator. Cancel whatever summer vacation plans you may have and start writing bill after bill that uses every tool and every trick at your disposal to send that right message to our soldiers over and over again until they come home--the message that nothing is off the table, that despite the threats and lies from the Bush administration, the Democrat will try everything to get our soldiers home and to end this madness. To try anything less than everything, Senator, is the only way to send the "wrong message" to our soldiers who are waiting eagerly for the United States Congress to step up--to rise with courage and wield the power handed to them by the United States Constitution, the American people and--most importantly--our troops in Iraq. Talking about National Service is a GREAT idea--and long over due for Democrats to once again grab hold of that vision for the country. What advice would you give to teachers who want to talk with American students about national service? And in one stretch of aggressive agit-prop that even Karl Rove would admire, Moore asks why the detainees at Guantanamo get better health care than the heroes of 9/11, as he sits among those heroes in a boat along the Cuba-U.S. border. Vito Valenti, a 9/11 rescue worker with pulmonary fibrosis who dragged his oxygen tank down the red carpet last night, said after the screening that it's obvious the U.S. needs "to reform health care and get everybody covered." Currently on disability, he volunteers to help 9/11 first responders with the nonprofit FealGood Foundation. Valenti is praying the public will see the film and take action. The nagging question in my mind--particularly in the face of Mr. Valenti's chronic pulmonary fibrosis, is the reality that insurance coverage by itself is not a guarantee of good health. What we discover more and more in contemporary America is that insurance policies are themselves a source of a great deal of fear--concern that regular premium payments need not lead to either good health or a life free from fear. More and more, the idea of having insurance is itself filled with fear--of denied claims, canceled coverage or sudden unexplainable increases in fees. Could it be that talking about our health strictly in terms of insurance coverage says more about the monopoly on health care by one particular industry than it says about a progressive vision for an America where our health is a source of strength and confidence? The first step is to realize how dominant the insurance frame has become and start believing in the possibility of talking about health without reference to money. John Edwards' framing of "universal health care" has been the core of his Take Back America speech--his key issue. He is miles out in front on this issue--way ahead of other candidates. What I notice in his framing is that he is talking about the problem of American health care as a problem of insurance coverage, a broad logic articulated most clearly by the phrase "every man, woman and child." Edwards repeated that phrase a half dozen times. The logic raises a key question: Should Democrats be talking about people first or insurance first? The answer: people. I agree wholeheartedly with Edwards' vision for a type of health care system that folds all Americans into the system. But I also want to suggest that we always lead with the people frame--health care for progressives is about people first. Should we talk about money at all? I wonder if the primary seasons is the time to do that. Eventually, the Republicans are going to accuse Democrats of socializing medicine and raising taxes. But they will keep accusing us even if we give them the serial numbers of the bills we will use to pay for better health care. So I say ignore the Republican's demands for financial plans and keep the debate framed on the well-being of people.